Altadena (wav), California is part of unincorporated Los Angeles County. It is located just North of Pasadena and just East of La Canada/ Flintridge. Altadena is bordered on the north by the Angeles National Forest. Neighboring La Canada/ Flintridge is home to Jet Propulsion Laboratory, operated by Caltech. The Altadena Guild of Huntington Hospital is sponsoring its 50th annual home tour, "On Top of the World for 50 Years", on Sunday, April 29, from 10:00 am to 4:00 pm. Check out the event link for more info. Altadena has a homey country feel. There are few paved sidewalks, hardly any condos, and few apartment buildings. Some areas are horse property. The proximity to the mountains means some homes backyards open onto trails. Altadena is the most racially and economically mixed area there is. You name it, we've got it. Truly, the patch work quilt of America's culture is well represented here. Altadena residents, be sure to check the "Community" area here for information about new developments, involvement opportunities, and Town Council information. 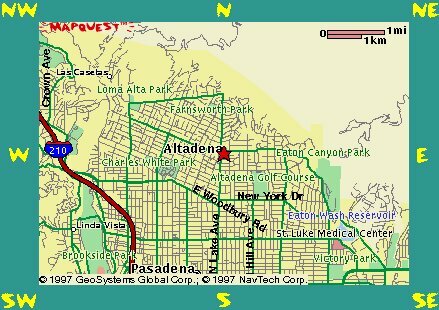 Altadena is a part of the greater Los Angeles metropolitan area. Any manner of cultural or natural recreation is close at hand from here. It is minutes away from most Los Angeles area destinations. Though we enjoy a rural country character to our neighborhoods it only takes as much as an hour to get to get to literally hundreds of popular destinations. Visit TravelNow and book all your reservations online! Echo Mountain, Mount Lowe Railway, trails and paths in our National Forest areas. the web version of the local history magazine about Southern California history in general and Thaddeus Lowe and his mountain railway in particular. Disneyland, Knott's Berry Farm, Magic Mountain, let's play! Disney World - the Online Guide, Information on parks, resorts, and restaurants. Also check out our international liasons, German American Meeting Point. Your comments and contributions are welcome here. Please send email to our webmaster. This site is maintained as a community service by Triple A Internet Masters, an Altadena based computer consulting and full service Internet company. Send email to CompanyWebmaster to report any problems.